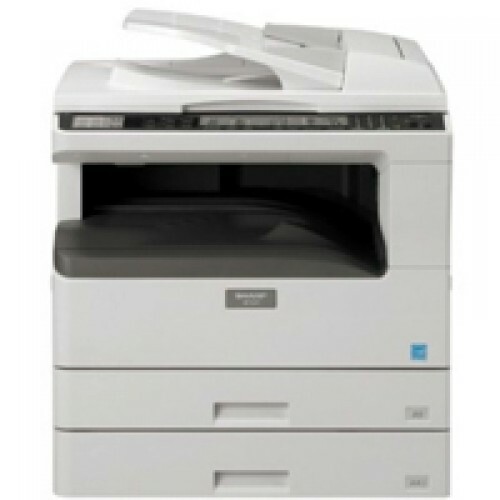 The Sharp AR 5620 is a black and white printer, copier and scanner. It has a rated speed of 20 pages per minute and offers colour scanning. It has a paper capacity of 600 to 1100 and contains a separation roller for smooth paper flow and fewer paper jams. The Sharp AR 5620, AR 5620D and AR 5620N have some versatile editing options such as dual page copy mode, rotation copy, margin shift, edge/centre erase and 2 in 1/ 4 in 1 which makes copying more convenient. The built in duplex module ensures that duplex copies can be produced automatically from one or two sided originals and this can be made even more efficient if the optional 40 sheet reversing single pass feeder is used.